This key text in educational leadership focuses on the significance of the context and culture of schools. The book addresses the growing recognition of cultural differences between societies and the resultant differences in schooling. 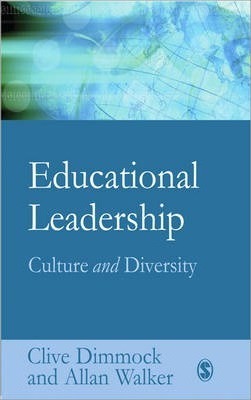 It also deals with vital issues relating to multicultural education and the leadership of multicultural schools. Drawing on their first-hand experience, the authors explore the differences evident in classroom teaching and learning, as well as organizational, leadership and management aspects of schools. They show how such differences can make over-reliance on Anglo-American approaches misleading, ineffective and restrictive. This book is essential reading for professionals and students of educational leadership and management, as well as administrators. Professor Allan Walker is the Joseph Lau Chair Professor of International Educational Leadership, Head of the Department of Education Policy and Leadership and Director of The Joseph Lau Luen Hung Charitable Trust Asia Pacific Centre for Leadership and Change at The Hong Kong Institute of Education. Before moving to the Institute, he was Chair Professor of Educational Administration and Policy at The Chinese University of Hong Kong where he worked for 16 years. He also worked at Nanyang Technological University in Singapore and in Universities in Australia and the United States. In 2010 he was made a Fellow of the Australian Council for Educational Leadership for his contribution to educational leadership research and development globally, but especially in South and Southeast Asia.